NEM-Watch v9 provides new visibility into the NEM for everyone who is interested in emissions intensity in the NEM, and in the different fuel types that are contributing to our electricity supply. 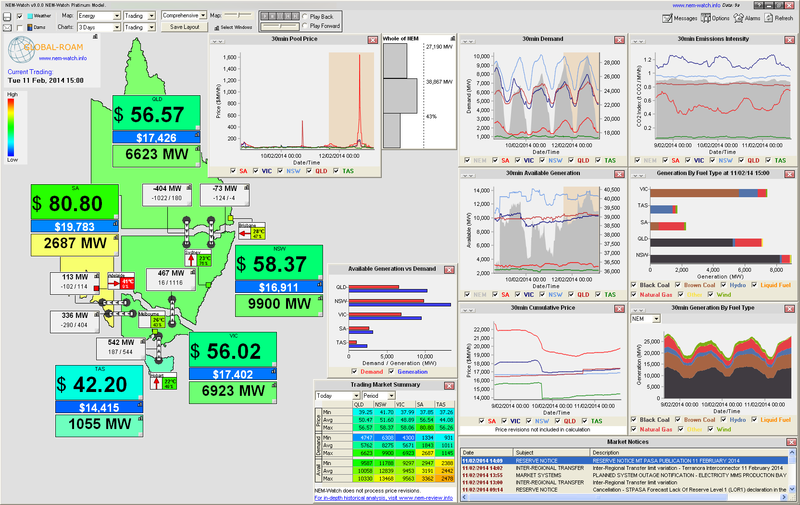 If you are interested in the relative contribution of various fuels to our electricity supply then NEM-Watch v9 will now show you generation by fuel type on both 5 minute and 30 minute basis. Use NEM-Watch to understand how the contributions of the various fuel types are influenced by factors such as time of day, weather, or demand. NEM-Watch includes a “Supply and Demand” reference for each region that shows AEMO’s forecast demand scenarios for the forthcomming year. We have updated these figures based on the data available from the AEMO web site. To see these figures simply select the region you are interested in from the “Supply and Demand” section of the “Show Windows” drop down menu item. NEM-Watch 9 includes a number of useability improvements designed to make NEM-Watch much more “friendly” and presentable. We have packaged two new screen layouts that are available for selection from the toolbar, and we have improved the way that you can save your custom layout. The “Comprehensive” layout is designed for large screen displays and includes all the main charts in NEM-Watch, together with a map configuration that is designed to be easily read from a distance. The “Simple” layout works for smaller screens and reduces the number of charts to the essentials. The “Custom” layout stores your own configuration – simply set up the screen the way you want it and select “Save Layout” in the toolbar so that you can quickly return to your layout at any time. We have restructured the toolbar in NEM-Watch to make the individual controls clearer and simpler. Please expirement with the controls – their behaviour is immediatly visible on the screen. In some circumstances the dates reported in NEM-Watch alarms for events in predispatch were a day out, this has been repaired, and these dates are now reported correctly. On Vista and later, it was sometimes not possible to open a Market Notice to view the whole text. This has been repaired and clicking on an entry in the Market Notices window will now open and display the full notice. The Market Notices window was disappearing from the bottom of the screen for some displays, but this has now been repaired and the Market Notices window now behaves like any other window in NEM-Watch.